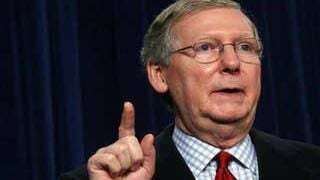 LOUISVILLE, Ky. (AP) - Senate Republican Leader Mitch McConnell is accusing his GOP primary challenger of embellishing his educational achievements in the latest TV attack ad of the campaign. The ad released Tuesday says Matt Bevin falsely claimed to be a graduate of Massachusetts Institute of Technology. The ad says Bevin never attended MIT. Bevin's campaign says the ad amounts to McConnell's "latest pack of lies." The campaign says Bevin attended the EO/MIT Entrepreneurial Masters Program from 2006 to 2008, and says that's the name printed on the certificate he received for finishing the program. McConnell's campaign says it made a six-figure television buy in Kentucky for the 30-second ad. McConnell and Bevin have been trading attacks since the political newcomer decided to challenge the five-term senator.